Mo. Gov. 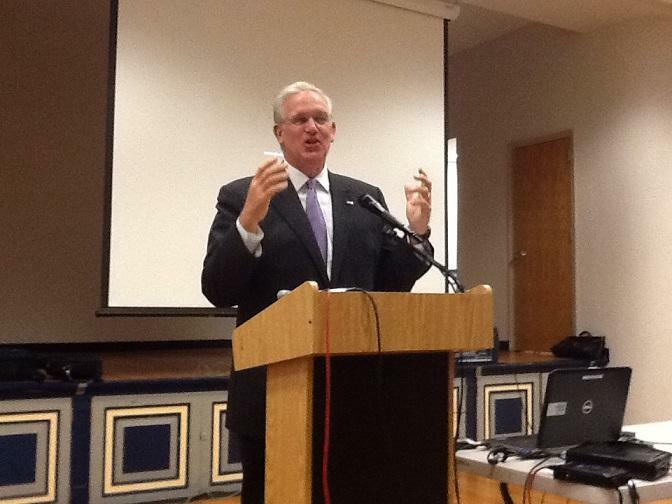 Jay Nixon (D) speaking to Higher Education officials in Jefferson City on Oct. 21, 2013. 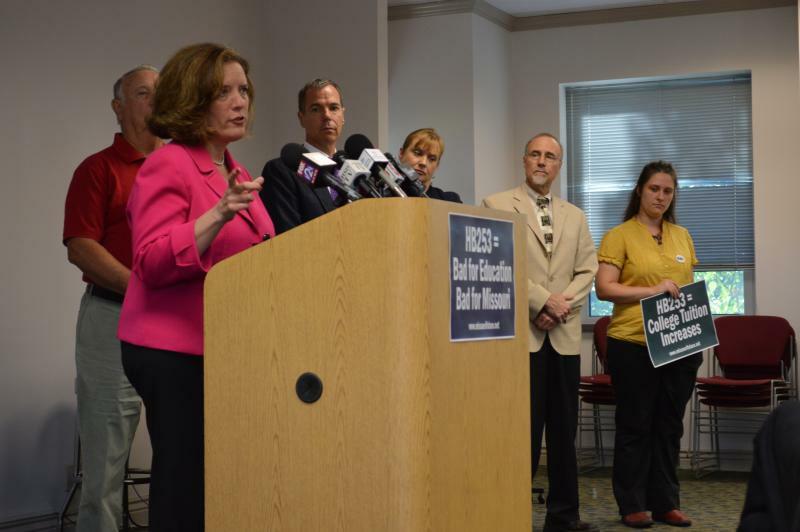 "The misguided economic theories on which House Bill 253 (were) based are still being touted," Nixon said. "Its supporters remain in the House and Senate, and its financial backers have millions more to spend." Nixon also told the audience that he hopes to fully fund Missouri's K-12 school funding formula before he leaves office in January of 2017. Members of a Missouri House interim committee tasked with improving government efficiency complained Wednesday about not having access to the full budgets of any of the state's universities. The committee was examining the Department of Higher Education. Republican committee member Kathie Conway of St. Charles says the department's annual budget requests to the Governor's office do not contain line-by-line expense requests she says the committee needs to do its job. A group of educators criticized a tax cut bill today that could severely hinder schools in Missouri. They maintained that the bill, which Governor Jay Nixon vetoed in June, would cut revenue for the state by $800 million and result in reduced funding for education. The superintendents from the Northwest, Washington and Hazelwood School Districts argued that the bill would have detrimental effects on their districts. Hazelwood superintendent Grayling Tobias said the bill could cause budget cuts for equipment and extracurricular activities, larger class sizes and fewer teachers. Updated at 6:03 p.m. to include details on a House-Sen. joint committee's proposal to use performance-based criteria in a new Higher Ed. funding formula. 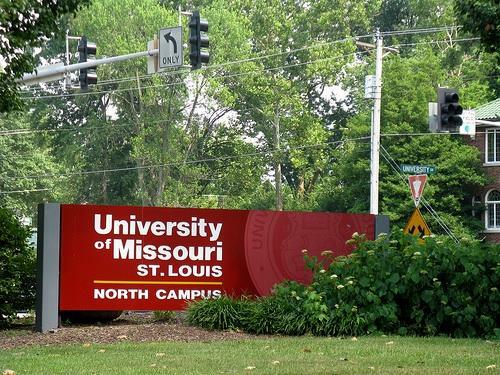 A joint House-Senate panel is recommending performance play a role in how much money Missouri’s colleges and universities get from the state each year. 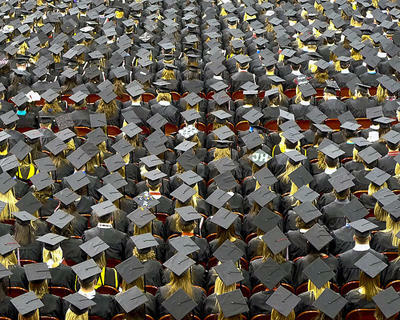 Panel members on Monday released a proposed Higher Education funding formula, which would include performance measurement in such things as student enrollment/retention, the number of research programs at an institution, and public service to the surrounding community or state. 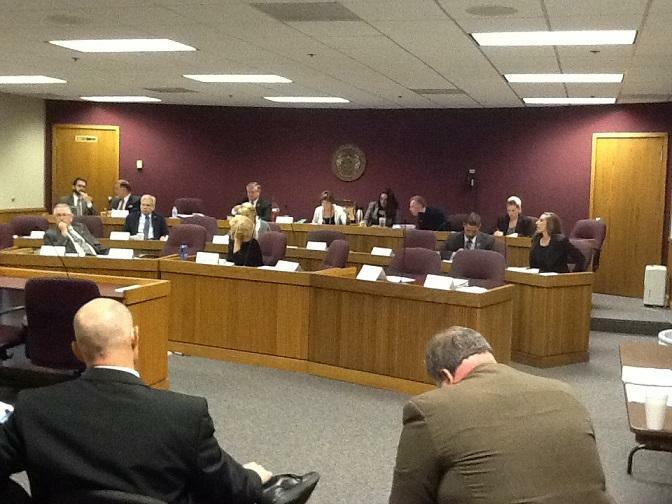 State Senator David Pearce (R, Warrensburg) chairs the Joint Committee on Education.